Our Moshi from day 14 was the rather butch Troy, today we have the much more thoughtful and spaced out, Pizmo, the Perky Pixinaut. Moving from ancient Greece to space, is something only a moshling series could do within one single step, and Pizmo is supposed to have landed on the Moshi world from a magical asteroid that smashed into the Copperfield Canyon. 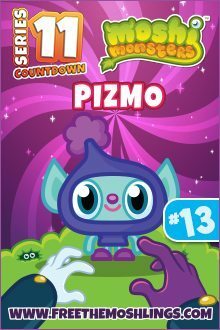 There are a few moshlings that have a distinct alien feel to them, not least Major from the last series, and Pizmo is continuing that trend. However, he does seem to have landed rather a long time ago, and these “aliens” have really found their home here, and are well established science experts within the Moshiversities. Here they lecture to the willing students on how to make bottle rockets, tinfoil spaceships and cardboard craters. Habitat: Who knows, they have a tendency to move about rather a lot so its a bit difficult to tell; they can beam themselves anywhere they blooming well want to with their head-mounted transporter bobble you see…. Dislikes: Gravity, it really messes with their heads, and possibly even their transporters, as well as slack holes, but then, who does? After our little trip into space, where will we be off to tomorrow?